For the most part, we really like these flash sale deals from sites like 1SaleADay and DailySteals. They often times offer still-relevant products at slashed prices to consumers who are always on the hunt for the best deal. For those of you who have followed us for our 3+ years, then there is probably a good chance that you have acquired a product from one of these sites. It’s tough not to. Well, until you see deals like today’s. 1SaleADay is offering up a refurbished version of the Nexus 7, our favorite Android tablet of all time. Normally, refurbished items are worth a look since manufacturers tend to fix known issues with them and essentially turn them into better-than-new products. But in this case, where the deal is for a 16GB version of the Nexus 7 for $180, we aren’t all that thrilled about this approach. 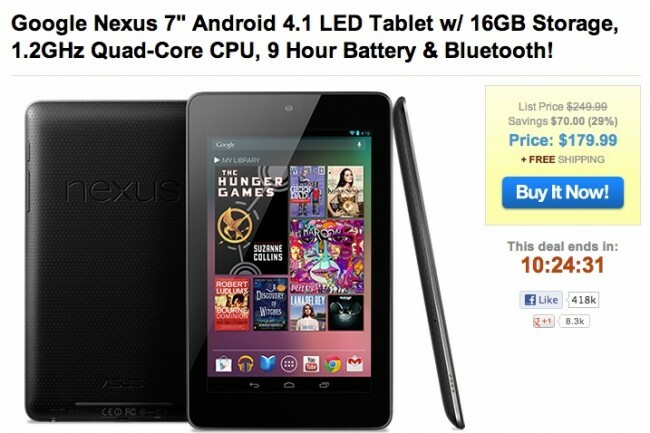 As you know, the Nexus 7 16GB can be had directly from Google for $199. This deal site wants you to believe that it actually costs $249, but that’s a lie. The 32GB version is $250, and this certainly isn’t that version. If there is one bonus to take away, it’s that the deal includes free shipping, though with deal sites, that can take up to a couple of weeks or a month before your product arrives. Google will charge you $14 to have it shipped. The lesson from today, is that you should never fully trust these deal sites. We try to highlight the legit deals, however, today’s like isn’t one of them.